Hi readers of Physics Horizon. It has been a few months since there was the last news post! The reason for this is I have been working hard on my 4th year at University. I hope to be able to bring you more regular news in the coming weeks and I am really glad that people have been looking and using my site during the quiet time on the site. I thought for the first post of 2015 I would give my readers an overview of what I am currently working on for my 4th year project. The first step in doing so is to introduce you to the idea of galaxy clusters. You may have heard that the Universe has the form of a cosmic web. This can be seen visually in the Millennium computer simulation below. This web is built up of threads of galaxies separated by vast voids of empty space. At the points where the threads intersect you have nodes with a large amount of galaxies. As these are more massive they gravitationally attract galaxies in the thread regions and hence large bound clusters of galaxies can form. So what we have at the moment is an idea of these massive structures called galaxy clusters which are continuously attracting galaxies out in the field, into their dense environments. The next thing to remember is that although we can see stars and galaxies that observable matter only constitutes roughly a quarter of the matter in the Universe. The unseen dark matter prevails throughout and structures such as galaxies and even galaxy clusters are effectively embedded in large halos of dark matter. Evidence for these surrounding halos of dark matter can be seen in a number of different effects. On the galactic scale, spiral galaxies should have a rotation speed which drops off with an increasing radius for their centre which is the classic Keplerian idea. In order to measure the rotation speed the redshift either side of a spiral galaxies disk can be measured. One side should be redshifted in wavelength (moving away) and the other slightly blueshifted (moving towards) and hence the speed of the rotation can be determined. When this analysis was performed it was found to everyone’s surprise that the rotation curve did not fall off with radius from the centre but in fact stayed flat! This implies that more matter than can be optically accounted for must exist throughout the galaxy. On the larger scale of galaxy clusters another method can be used to infer the presence of dark matter. Einstein 100 years ago published his general theory of relativity, which described the Universe as having a 4-dimensional space-time. This can be imagined for our purpose as a 2D flat sheet, but keep in mind that the surface of the sheet is actually in the real Universe 3 dimensions of space and 1 of time interwoven. He describes the orbits of planets and influence of gravity as the warping of the geometry of our space-time sheet by massive objects, opposing Newton’s explanation of gravity as a force. 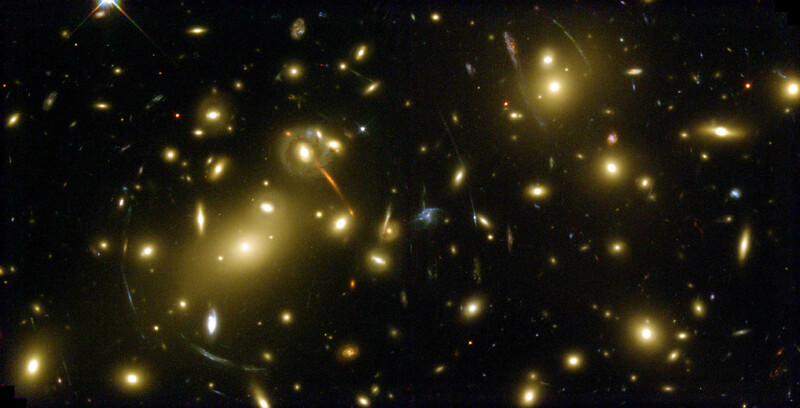 The idea behind gravitational lensing is that large masses such as entire galaxy clusters can bend the space-time sheet a substantial amount. Light can normally travel in a straight line on the sheet from a source to an observer. However is you have this large mass between the two then the light has no choice but to follow the sheet and bend around the galaxy cluster. Evidence for this effect close to the dense cores of these galaxy clusters can be actually observed in nature! They are seen in the second image below as the arcs about the core of the galaxy clusters. These are actually much further away background galaxies which have been spread out, magnified and warped by the cluster lens. Now the important point to take from the process of gravitational lensing is that if its the mass of the galaxy cluster which is causing the warping of space-time, then by measuring this effect we can directly calculating the mass of the cluster within the arc radius. By using these arcs and calculating the amount of mass within the centre of these galaxy clusters, it was found that once again the observed mass cannot account for everything! The final piece of the project puzzle is to understand what happens when galaxies outside of these large galaxy clusters gets drawn in. As mentioned earlier both the galaxy and the cluster are embedded in dark matter halos, with the latter being much more massive. As the galaxy falls into the cluster the gravitational attraction between the dark matter halos of the galaxy and cluster becomes stronger. The cluster halos begins to strip the galaxy halo of dark matter as it gets tidally attracted, which effectively also contracts the dark matter halo of the infalling galaxy. 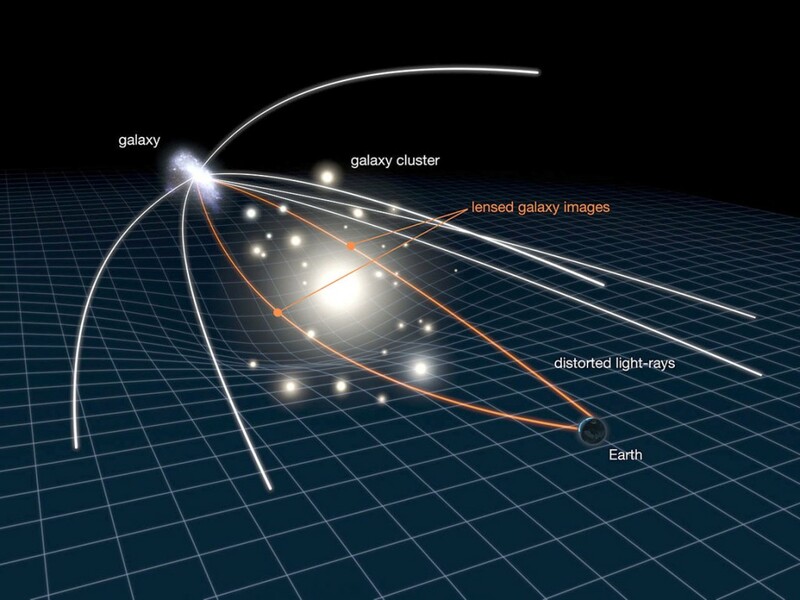 My project is to use analyse this technique of gravitational lensing but not upon the galaxy cluster halos but actually upon the galaxy halos. By measuring them at different distances from the cluster centre there should be a trend observed of the galaxy halos becoming less massive and more contracted the closer to the core they become. 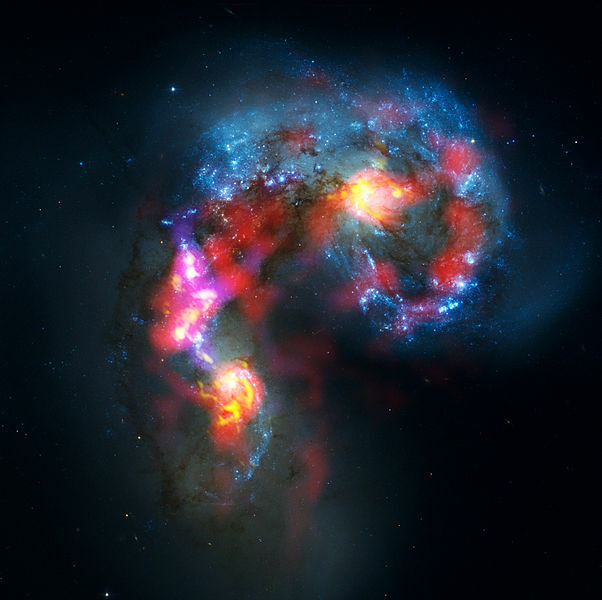 This research is at the cutting edge of large scale astrophysics and cosmology. It offers a unique view of galaxy and structure evolution and allows one a glimpse at an unseen world. The dark world with the motion of this infamous dark matter. On the day that India managed to place a satellite in orbit around the red planet another massive announcement has been turning heads in the search for extraterrestrial life. One of the assumed requirements for life is water, however when searching on planets smaller than Jupiter they encountered a problem. All these planets seemed to have thick cloud cover which made it almost impossible to do useful spectroscopy on the atmosphere. But for the first time a planet the size of Neptune orbiting a star 120 light years away in the constellation Cygnus. The atmosphere of this planet HAT-P-11b has a majority Hydrogen with 25% water vapour. However although this sign of water vapour has been detected the planet is not considered classically habitable with a surface temperature of 900K. Although this planet has a very low chance of hosting life as we know it the detection sets the premise for further detections on planets with more comparable sizes. The even more exciting prospect would be if there was found a trace of methane in the atmosphere as this would be a very convincing signature of life. With the discovery of planets making an increasing rate it won’t be long until we find Earth 2.0. A paper released today after careful analysis of the CMB (cosmic microwave background) map captured by the Planck satellite have revealed that contrary to the claim by the BICEP2 telescope of polarisation in the photons from the CMB this could be purely due to unaccounted for galactic dust. 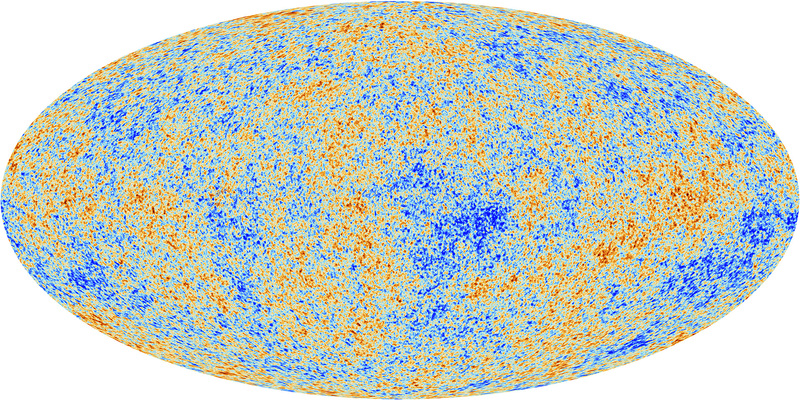 The original BICEP2 evidence released in support of polarisation in the CMB in support of cosmic inflation. The BICEP2 team in March this year announced at an important press release that they had detected a 5-sigma detection of polarisation in the CMB which would confirm inflation and also fit nicely with the idea of primordial gravitational waves. It was an announcement that if proved true when tested by fellow physicists would change the face of cosmology forever. However over the months since that announcement many people have had doubts with how the team dealt with the prediction of how much galactic dust lies between the telescope and the CMB. This dust can if not correctly accounted for produce a polarisation effect. The Planck team after analysis across the sky (and not just in one small spot like BICEP2) have released a paper which states that the signal is unfortunately most likely just an excess of galactic dust than was expected when the team were performing their study. Although this is a setback for confirmation of cosmic inflation, it is not it’s doom. The BICEP2 mission is now collaborating with Planck to find regions of the sky in which the galactic dust column is much more sparse to continue further study. 1. The universe has fine tuned constant which allow for a unstable completely flat geometry. But why should such fine-tuning exist? 2. 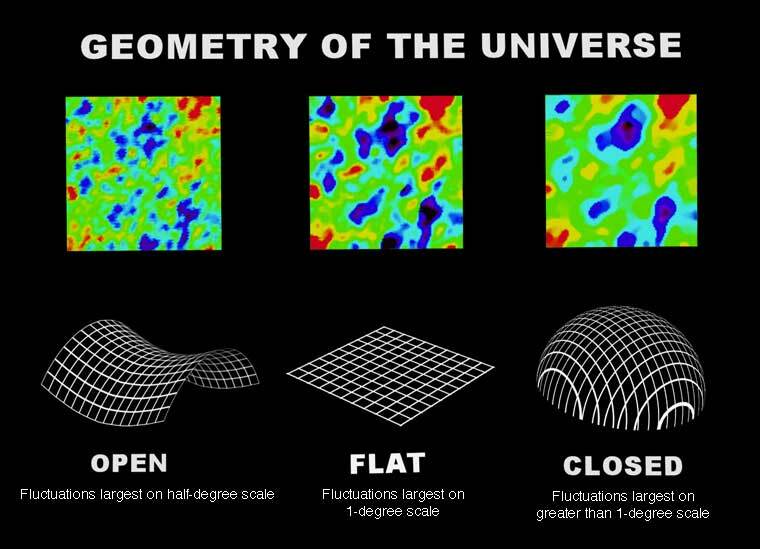 The universe is not completely flat but cosmic inflation has caused the geometry to tend towards flat. Like the surface of a massive balloon. It may start of curved but blow it up to the size of the earth and the horizon will look flat. Diagrams describing the 3 possible 4-dimensional geometries of the universe with the corresponding CMB signature angular scales. Cosmic inflation is the favoured theory to explain these abnormalities in nature and it is imperative that further research be put into confirming or denying its validity. Whether further study by Planck or BICEP2 help or hinder the theory of cosmic inflation one things for sure, it will be an exciting time to be a cosmologist. For the last 10 years the Rosetta spacecraft has been speeding across the solar system in order to attempt a first for humanities space exploration. The craft is preparing to rendezvous with the comet 67P (Churyumov-Gerasimenko) with a schedule of landing on the 11th November 2014. Today ESA released on which proposed landing site the craft will touchdown. The comet itself is around 4km across and was previously thought to be a couple of coalescing comets due to its unusual shape. However as Rosetta has drawn closely and began imaging after her widely publicised “wake up” on the 20th January, it has become more clear that this comet appears to be one rock in a “rubber-duck” shape. Although none of the 5 potential sites are completely deemed ideal by ESA to make a confident landing, it was decided today that site “J” which is located on the smaller head of the “duck” will be the primary landing spot. This offers ESA the possibility of a 70 to 75% success rate at what is thought to be the most challenging space landing in exploration history. As well as the obvious excitement of overcoming such a monumental task of landing on an object travelling at just over 36,000mph which is only 4km across, with an uneven landing site, the Rosetta mission holds greater interest. The question of where life came from has always been one which has puzzled the great thinkers over the ages. One of the most widely believed theories is that the chemicals for life or life itself may have originated from outer space and arrived on comets like 67P. In fact it is thought that over the timescale of the first billion years of Earth’s history that the onslaught of comets may have actually given rise to all the water found in the oceans. If Rosetta detects the signatures of life on the comet this will have important implications on the important question of life’s origins. For those less familiar with comets you may wonder why comets would transfer water? Although comets have sometimes been portrayed in films as rocky objects they are primarily formed from ice which is in fact what produces their beautiful tails. As they approach the sun then the ice evaporates of the back side of the comet producing this wonderful tail which is beautiful to see in a telescope or image. Below is an image taken using the University of Birmingham’s Observatory which I was involved in. This image shows the comet ISON (before it’s unfortunate demise) which displays the lovely tail of the comet. The hope now is that Rosetta has a safe landing this November to bring us closer to the possibility of finding the origins of life. To get the public involved with the mission ESA will also be releasing details of a competition to give site “J” a more catchy name! I will post more on this story when they release more… watch this space! 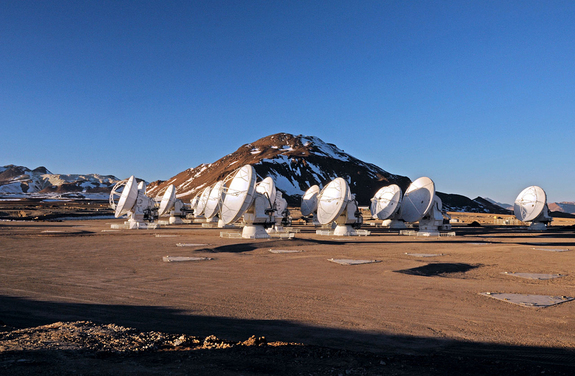 At 5000 meters above sea level in a Chilean desert sits the Atacama Large Millimeter Array (ALMA). This array consists of 66 radio telescope dishes and was officially opened in March 2013. This marvel of technology has already peered through cosmic dust clouds in the milky way to observe planet formation and distant galaxies. However working in these extreme conditions where chapped skin, altitude sickness and low temperatures are an everyday occurrence is taking its toll on the operating crew. ALMA has currently been taken offline whilst the various personnel living and working up on the Chajnantor plateau negotiate with their associated universities for a 15% pay rise with extra benefits. The reason behind the array being located in such a harsh environment is to do with the nature of making radio observations. In the long wavelength section of the electromagnetic spectrum the atmosphere (especially water) absorbs radiation from astronomical sources. Therefore in order to observe in this region a high and dry condition is needed to give the best possible observing conditions. This equation means that the longer the wavelength being observed the wider the diameter of the telescope itself needs to be in order to have a small enough angular resolution so that the distant objects can be viewed. In visible light (λ=550nm) to obtain a reasonable resolution only requires up to meters in diameter, whereas radio astronomy (λ>mm) would require a single antennae diameter of many kilometers. This is a massive problem as this means the resolution of observation is going to be nowhere near good enough for distant galaxy observations. but where B is now the base line of the array. This base line refers to the distance between the two furthest antennae in the array. This now can allow a distance of kilometers to exist and hence vastly improve the resolution of observation. The hope from everyone is that ALMA can resolve the monetary issues soon so that this wonderful radio telescope array can reach it’s full potential. Over the past few years one of the most successful NASA projects is the exo-planet hunter Kepler space telescope. However recently a malfunction has occurred in the precision steering of the machine which has meant it is impossible for the mission to continue finding earth-sized planets around other stars. 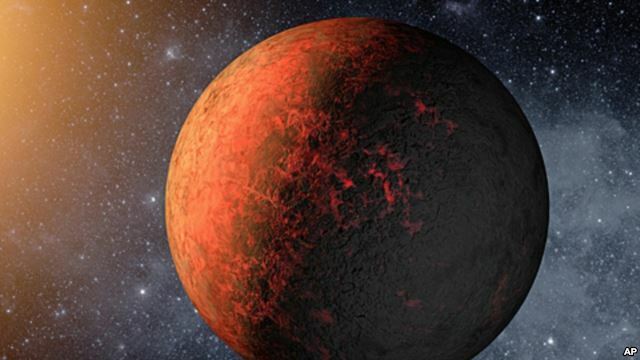 Although the telescope is out of action finding further data, scientists are now left with more than two years of data to search through to find further exo-planets. Thus far there are 135 confirmed planets in the catalogue but with nearly 3,500 possible candidates. However the legacy of NASA’s exo-planet finding success will continue with the proposed Transiting Exoplanet Survey Satellite (TESS), scheduled for flight in 2017. The satellite itself may also have a future with the Kepler team discussing a multitude of alternate missions including finding planets through gravitational microlensing which would not require such an accurate precision steering. Thank you to Kepler for finding us exotic planets with a variety of atmospheres, changing some of the accepted ideas behind planetary system formation and even finding the first mercury sized planet. We look forward to what other surprises wait in the archive of your results and to your successor. Milky Way has a Dark Matter deficit? A new set of galactic formation simulations has suggested that our Milky Way could actually contain only 1/4 to a 1/3 of the previously accepted quantity of Dark Matter. When scientists observe other spiral galaxies in the Universe one property which is commonly investigated is how the rotational velocity of the stars is related to the radius from the galactic core. The original theoretical prediction was that the rotational velocities would increase rapidly in the centre (v proportional to r), by treating the core as a solid body and then on the outer regions could be treated as having Keplerian orbits (similar to those of the planets around the sun) (v proportional to r^-2). 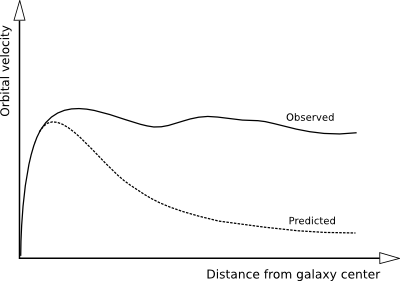 However when astronomers pointed there telescopes toward galaxies and analysed the rotation curve they found one reoccurring difference between theory and observation. This difference is that at an increasing distance from the centre the rotational velocity does not fall off and instead generally remain flat. This describes a system in which (at a certain distance from the core) the orbital velocities of the stars remains constant independent of radius. In order for this new information to be incorporated into the galactic model it was decided that there must exist a halo of some unseen matter which is driving the extra acceleration required further from the centre. Due to this and measurements of weak gravitational lensing in certain galaxy clusters it was decided that this unseen ‘Dark’ matter must make up around 80% of the matter in the universe. A recent survey conducted at the University of California has provided two simulations of galaxy formation first with a dark halo mass of 2 trillion suns and the other 800 billion suns. It was found that the lower quantity of dark matter actually provided a better fit for the current morphology and mass of our galaxy. Does this point towards our galaxy being irregular in comparison to the average spiral galaxy? or could it perhaps point towards the current theory of dark matter being incomplete? If you have happened to look up in the sky tonight you may have more than likely seen a beautiful ‘shooting star’. 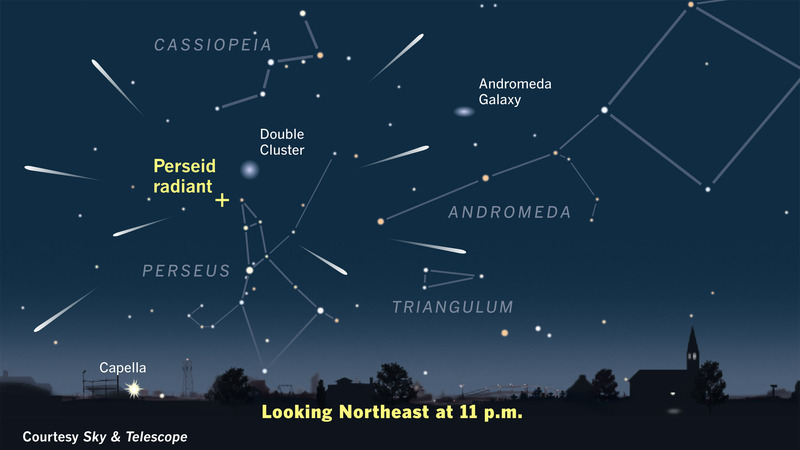 This is the Perseids meteor shower and is actually due to the earth moving into the orbit path of a comet called Swift-Tuttle. Debris that has fallen off trails behind the comet and as the earth moves into Swift-Tuttle’s orbit these hit the atmosphere. The friction caused by the air causes the shard to heat up to incredible temperatures and disintegrate away. If you haven’t seen them yet and its clear where you are then get outside it won’t take to long to see them. A new exhibition has opened up at the Royal Greenwich Observatory in London which displays the winner and runners up of the competition. 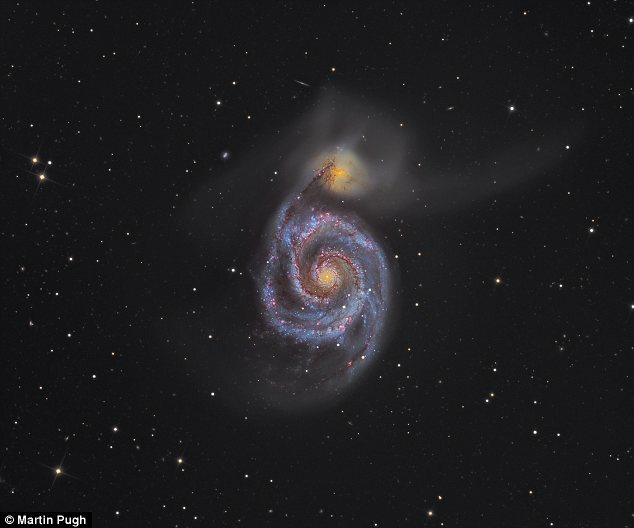 The winner in 2012 was taken by Martin Pugh of the Whirlpool Galaxy known in the Messier catalogue as M51. The competition was open up to all astrophotographers, judged by Sir Patrick Moore and others. This image of M51 has been described by many professionals as one of the best examples they have ever seen and for good reason, the image is taken in multiple wavelengths and have all been overlay to give a hybrid image showing the galaxies profile across the visible spectrum. Entrants for the 2013 competition has begun and it is free to apply at http://www.rmg.co.uk/astrophoto. Other runner’s up of the competition can be found in the Astrophotography section of the blog. On the night of 21st September 2012, space debris in either the form of satellite junk or interstellar dust has been seen burning up in the atmosphere all across the UK. The phenomenon has caused a number of calls to the police regarding planes crashing. As the debris enters the atmosphere it will have been travelling at a fast rate close to 18,000 mph, this speed when moving from the extremely low density of space into our atmosphere with an increased air density the lower to the ground it falls. The object has much more drag upon it and therefore the friction causes it too heat up and breaks into pieces. The Dark Energy Survey has taken its first image as of the 12th September 2012 of the Fornax galaxy cluster. The 570 million pixel camera used for the survey takes a shot which covers a area of the sky around 20 times larger than the full moon. 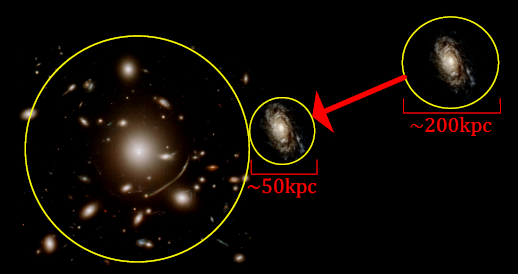 Thesurvey will eventually cover 100,000 galaxies and around 4,000 type 1a supernovae. The survey is looking into the hypothesised Dark Energy which makes up just over 70% of the universe. Dark Energy is believed to exist due to the findings in 1998 by Saul Perlmutter that the redshifts of distant type 1a supernovae pointed towards an acceleration in the expansion of the universe. In order for this acceleration to occur a force3 must exist which acts against the overall gravitational attraction of matter but is also 3 times as much. Therefore Dark Energy is said to be spaced evenly throughout the universe with a constant density. 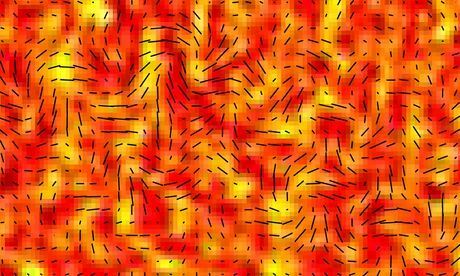 The discovery of this accelerated expansion won Saul the 2011 Nobel Prize for Physics and now this Survey’s job is to ask the question of what this energy is and if there is any way of directly detecting it. 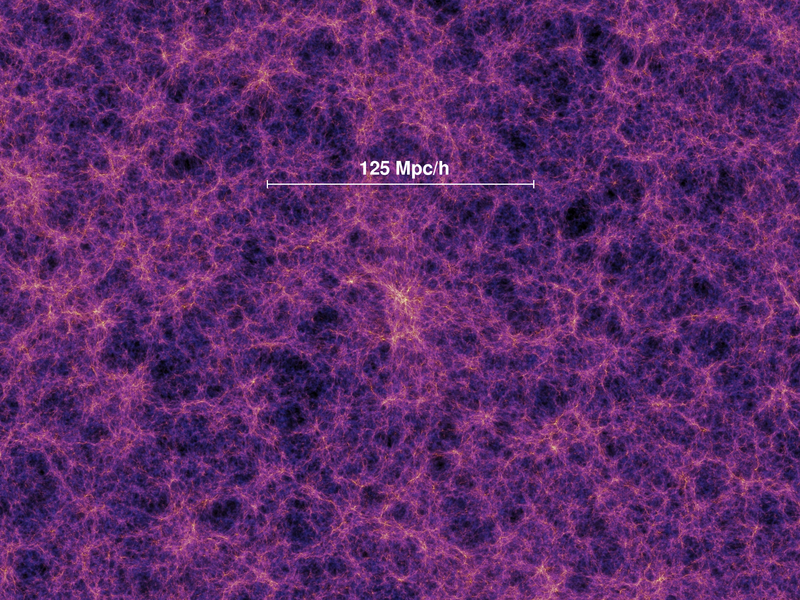 The Survey will use a number of techniques to investigate this Dark Energy, the conventional technique of taking the redshift of type 1a supernovae to plot the rate of expansion and the mapping of many galaxy clusters to look at early formation. Type 1a supernovae are so useful due to there similar luminosity curves which is caused by the way they are produced. In a binary system of an ordinary star and a white dwarf, the dwarf accretes matter from the other star until its own mass is greater than that of the Chandrasekhar limit (around 1.4 solar masses) at this point the electron degeneracy can no longer hold the gravtational collapse and the white dwarf “explodes” in a supernova. As this always happens at the same mass the luminosity curve is always the same, this means that this type of supernova can be used as a standard candle in the sky by which a distance and redshift can be easily measured. NASA’s newest rover, Curiosity has finally finished its month of preparation and will finally begin to explore the red planets landscape. Many will have already heard about this engineering miracle but in case you haven’t Curiosity is about the size of a small car it is mounted with multiple cameras which take high definition photographs in black and white and full colour. Some of the more impressive features include an on-board chemistry laboratory which is used to analyse the Martian rocks and also a spectrometric laser. Not only was this Rover an engineering breakthrough but also the landing mechanism was the most challenging ever attempted. With the Rover being catapulted from orbit to the surface of the planet at 13,200 miles per hour and had to be slowed down to around 1,050 miles an hour via parachute deployment. After this the landing craft needed to use thrusters to slow down the Rover entirely and float it down to the Martian surface. As if this wasn’t risky enough due to the distance that Mars is from Earth and the limitations of the speed of light the whole procedure had to be automated with no human intervention.